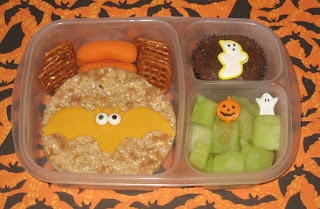 BentoLunch.net - What's for lunch at our house: Halloween Bat Bento! In this week's unpacking extravaganza, I've found my EasyLunchboxes, my cookie cutters *and* some Halloween decorations. I still have not found the silverware, for those keeping track, and actually asked a Dallas friend to go check our old house and see if it got left (I am out of places it could be around here). But Halloween stuff makes me happy! 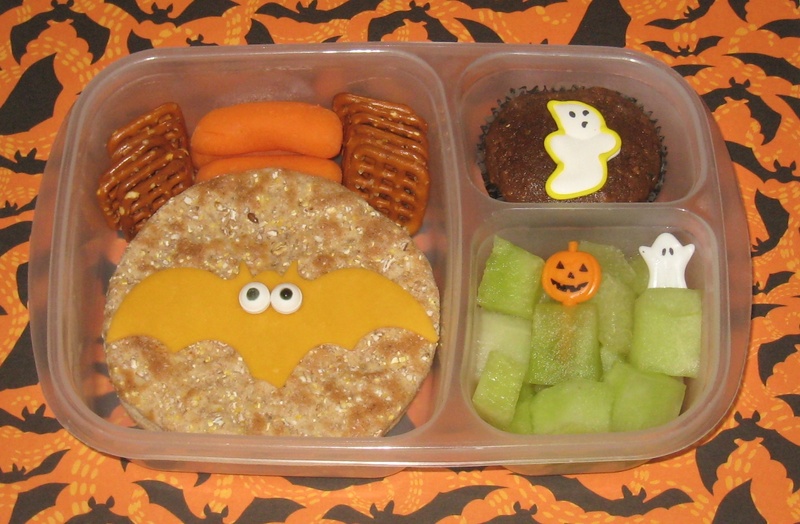 Ben has a ham & turkey sandwich on multigrain rounds, topped with a cheddar bat with sugar eyes. The bat is making me all sorts of happy today, just because he's more interesting than anything I could make in a hotel room. Of course, as mentioned, it's packed in Easy Lunchboxes, which are also available on Amazon if you need a set of your own (both kids and my husband use ours!). And yes, finding my bento supplies? Also makes me happy! It's a good day. There's no place like home, huh Shannon? So happy you are back to whipping things up in a real kitchen! The muffin looks positively divine. Glad to see you back up and making cute lunches. You have inspired me so much! I love your bat! What a cute lunch!